NOAA Fisheries says the Snake River sockeye will be recovered when 2,500 natural-origin spawners return on average annually to the lakes of the Sawtooth Valley in Central Idaho. It calls for an average population over 10 years of 1,000 naturally spawning sockeye in Redfish and Alturas lakes. Another 500 would be required in either Petit, Stanley or Yellow Belly lakes. The sockeye is best known for swimming 900 miles up the Columbia, Snake and Salmon rivers and climbing 6,500 feet to spawn in Redfish Lake in the Sawtooth National Recreation Area. It's the world's southernmost sockeye population. The captive-breeding program that prevented extinction helped return 460 naturally breeding spawners in 2014, beating the old high of 179 in 2010. But the return of just 78 in 2013 underscores that it's a long road. 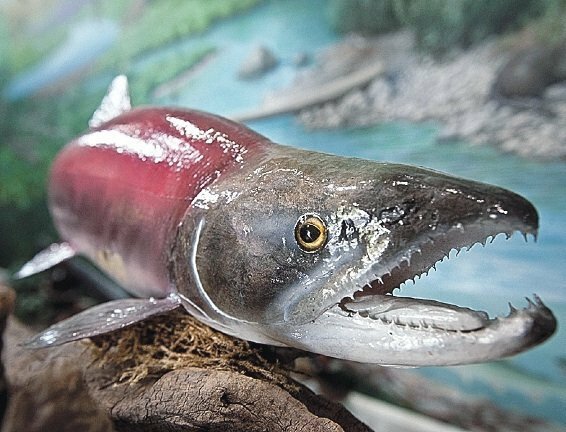 The plan was developed collaboratively by biologists and other experts from NOAA Fisheries, the Idaho Department of Fish and Game, the Shoshone-Bannock Tribes, the BPA, Idaho's Governor's Office of Species Conservation and the U.S. Forest Service. The plan outlines more than 90 specific actions to rebuild a self-sustaining population of Snake River sockeye over decades. "With our support, these resilient fish have already defied the odds by coming back to the extent that they have," said Will Stelle, West Coast Region administrator for NOAA Fisheries. "Sockeye cannot be recovered without improving their main-stem survival, and the only way to do that is to remove dams on the lower Snake River or, in the meantime, increase spill at dams on the Columbia and Snake rivers," said Greg Stahl, Idaho Rivers United salmon program coordinator. "We are committed to putting our collective weight behind Snake River sockeye in the form of this recovery plan and we have confidence that one day we will declare them recovered," said Virgil Moore, Fish and Game director.